I was recently given an iPod docking station which was supplied with a 'power brick' type of power supply. As I also had a redundant switched mode power supply from a defunct router, I thought I'd compare the two. As there was a significant difference in the power used, I thought it might be informative to do a similar test with two router power supplies, both rated at 12V DC, 1A. In the 'Not connected' test, the power supply was plugged into the mains but not into the router. The table below shows the Power Factor, current and power consumed on the 245v AC side. Surprisingly, the power saving with the switched-mode was not as significant as I'd expected considering the results with the other power brick. 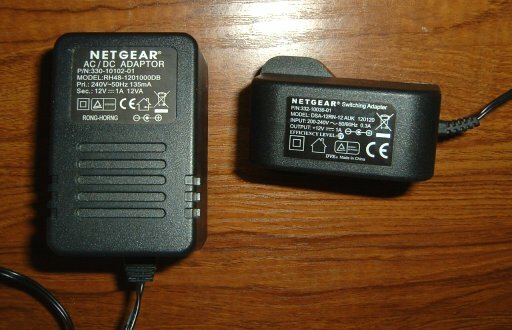 The router was a Netgear DG834 v4.